EconomicPolicyJournal.com: Who Owns the $21.5 Trillion of U.S. National Debt? 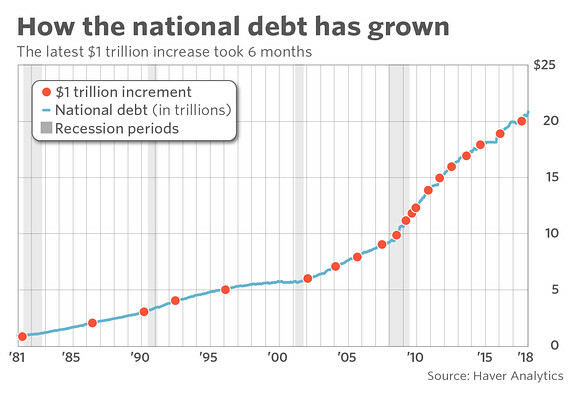 Who Owns the $21.5 Trillion of U.S. National Debt? At this writing, the U.S. national debt has nearly reached $22 trillion, rising by nearly $500 billion since the U.S. government’s 2018 fiscal year ended on September 30, 2018. But to whom does the U.S. government owe all that money? Here’s an answer to that question, as if it were asked before the U.S. government’s 2019 fiscal year began. From the end of its 2017 fiscal year to the end of its 2018 fiscal year, the U.S. government’s total public debt outstanding increased by $1,271 billion, or $1.3 trillion, to reach a total of $21,516 billion, or $21.5 trillion. Put a little bit differently, the U.S. national debt grew at an average rate of nearly $3.5 billion per day on every day of the government’s 2018 fiscal year. That’s a very large number, but 2018 was only the sixth largest annual increase for the U.S. national debt in terms of nominal U.S. dollars. Larger increases were recorded during President Obama’s tenure in office in 2012 ($1,276 billion), 2010 ($1,294 billion), 2011 ($1,300 billion), 2009 ($1,413 billion), and 2016 ($1,423 billion). So it’s not an accident that the U.S. national debt has risen to $21.5 trillion, where these six years combined account for 37% of the official U.S. national debt. But to whom does the U.S. government owe all that money? 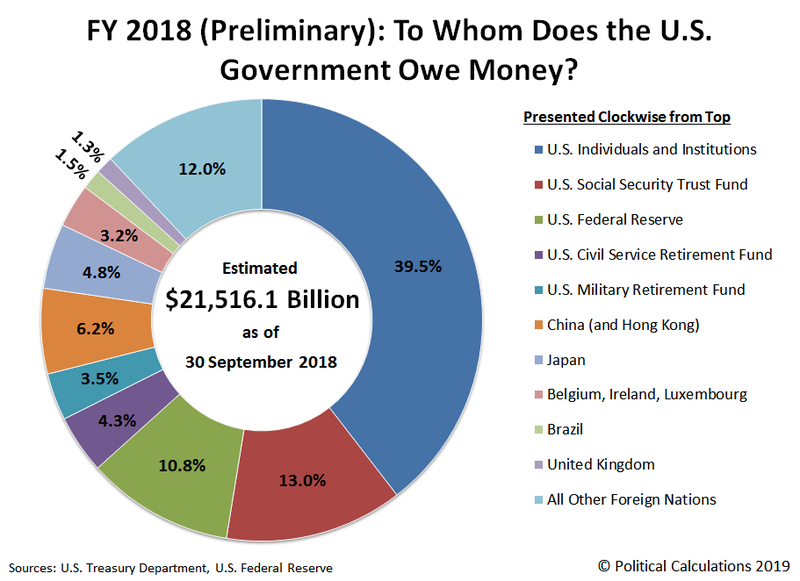 The following chart breaks down who the U.S. government’s major creditors were at the end of its 2018 fiscal year, which is based on preliminary data that will be revised in upcoming months. The Congressional Budget Office forecasts that trillion-dollar deficits will soon be a permanent feature of the U.S. government’s fiscal outlook for as far into the future as they are willing to look. Who can blame them for having a pessimistic outlook? The notion that one can be held responsible for the incurred debts of one's forebears, is offensive, outrageous, and anathema to traditional Western principles of liberty, fair-play and justice. And yet, the government gets to saddle our descendants with debt-repayment obligations (taxes) in perpetuity. Alexander Hamilton (our most evil Founding Father) understood the importance of the Federal government taking-on national debt, because the creditors' expectation and desire for the government making good on its debt would be the surest guarantee of support and stability for the fledgling Federal government.